On Thursday, March 14, Twin Valley Community Local Schools held a “meet and greet” for community members to interact with the final two superintendent candidates. Tracey Miller was the first candidate everyone had the opportunity to meet. Kelly Schooler was the second superintendent candidate Twin Valley Community Local Schools community members had the opportunity to meet on Thursday, March 14. WEST ALEXANDRIA — Twin Valley Community Local School District is looking for a new superintendent. On Thursday, March 14, the school held a “meet and greet” for community members to interact with the final two candidates. Tracey Miller was the first candidate community members had the opportunity to meet. He is currently the deputy superintendent from Dublin City Schools. He went to college at Bowling Green University, before working at Lima City Schools for eight years. He went back to school at the University of Dayton to move into administration and then took a position at Hamilton City School to be closer to family. Nine years later, he took a position at Dublin Schools, where he worked 16 years for the district. When asked why he wants to work at Twin Valley, he responded, “School systems are the same. I’ve worked in three, I’ve visited countless. Kids are the same, education is the same, a lot of it is the same. I work with a lot of adults. That is not my passion. I love Dublin, it has been great for me and my career, but my next chapter, I need to take me closer to the classroom. He was also asked what his commitment to the district would look like, since the district has had many different superintendents over the years. “One of life’s greatest stressors is moving. It took me an hour and a half to get here today and that is not sustainable, so we’re going to move. It is just my wife and I right now, we’re empty nesters with both of our kids in college. The commitment there is that I’m not going to want to move again. The next thing is, my wife has made it clear, ‘You will work.’ We’re going to move and I’m going to work,” he said. When asked his input on state testing, he talked about the Ohio School Report Card. “The question I would have for you and the community is, how do you feel about the report card? That is kind of the answer. I know how I feel about it as well. We work for the community. What are we comfortable with? Then it goes back to creating a document that tells the rest of the story. It is the profile of the district that tells so much more than your test scores. It would talk about our arts, music, athletics, and all the great things our kids are doing,” he said. Kelly Schooler is the second candidate community members had the opportunity to meet. She is currently the Elementary Principal from Perry Local Schools. She has 25 years of education experience, beginning with receiving her degree at Bowling Green University. After graduating, she went to her home district where she was born and raised. She served at Lima City Schools for three years before getting her Masters Degree at Ohio State University. She went to Texas to get a Leadership Lifetime Certificate. She served as a principal at Columbus Public Schools for eight years, during which she had an opportunity to do a professional development year in the United Kingdom. She then went back to her home district, where she has been for the past 12 years. She was also asked what her commitment to the district would look like, since the district has had many different superintendents over the years. “I definitely am happy to see work come to fruition. I’ve always lived in the district that I’ve served. I defeintly would want to take residency in the community. This would be my first gig. My mentor superintendent was with our district 35 years and he was a teacher, principal, and then superintendent. His biggest comppliment would be when people told him, ‘We thought you were from Perry.’ I understand that compliment. I would have a desire to be close,” she said. When asked her input on state testing, she talked about the Ohio School Report Card. “I think that is a big community reflection. I deliver the yearly accountability report to the community and the board — the one that explains the scores and everything. Nobody comes! That is because our community trusts us. The elementary got a ‘B’ last year, the high school ended up with an overall ‘D’ in the district. Our community knows what we did every year. To be honest, they don’t care what the state says about us, they know what we do every day,” she said. 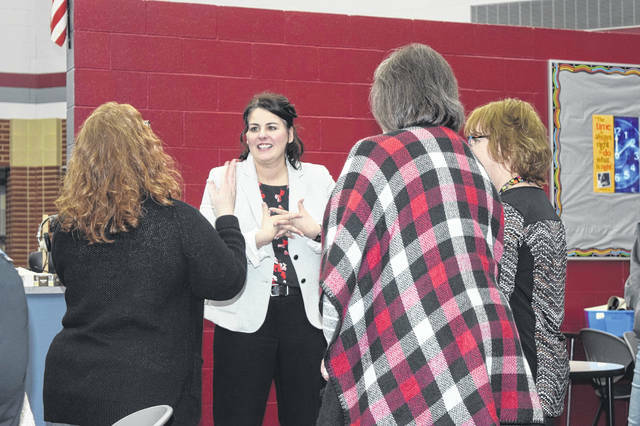 https://www.registerherald.com/wp-content/uploads/sites/41/2019/03/web1_PS1.jpgOn Thursday, March 14, Twin Valley Community Local Schools held a “meet and greet” for community members to interact with the final two superintendent candidates. Tracey Miller was the first candidate everyone had the opportunity to meet. 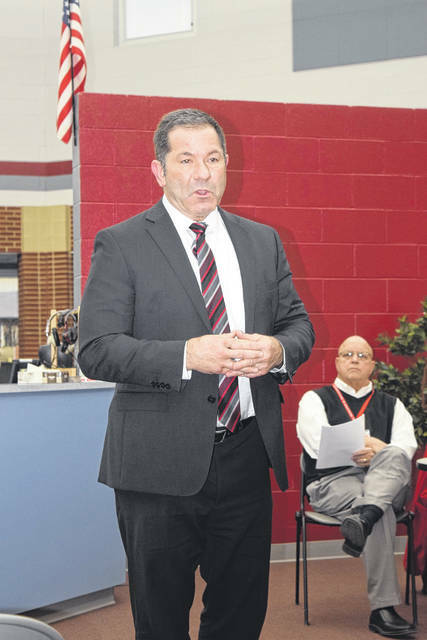 https://www.registerherald.com/wp-content/uploads/sites/41/2019/03/web1_PS2.jpgKelly Schooler was the second superintendent candidate Twin Valley Community Local Schools community members had the opportunity to meet on Thursday, March 14.